One of the most annoying things about Windows is the tooltips popup in Explorer. Generally, the reason I'm using explorer is to locate a file, but the annoying tooltips popup keeps covering up filenames. The popup itself doesn't display any useful information. It really kills my productivity because I have to keep moving the mouse pointer to make the popup go away. If you feel the same as I do, you can easily disable the annoying Explorer tooltips popup. 1. In Control Panel, click on the Appearance and Personalization link. 2. On the Appearance and Personalization page, click on Folder Options. 3. 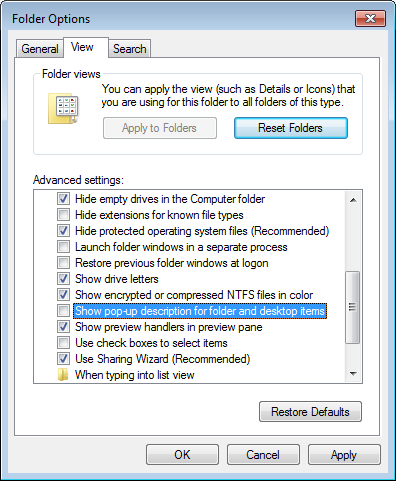 In the Folder Options dialog box that appears, click on the View tab. 4. On the View page, scroll down to, and uncheck  Show popup description for folder and desktop items. 5. Click on the [Apply] button. Click on the [OK] button. No more annoying tooltips popups, now your productivity can soar! • Google Apps vs Microsoft Office 365: Which is Best for Your Business?